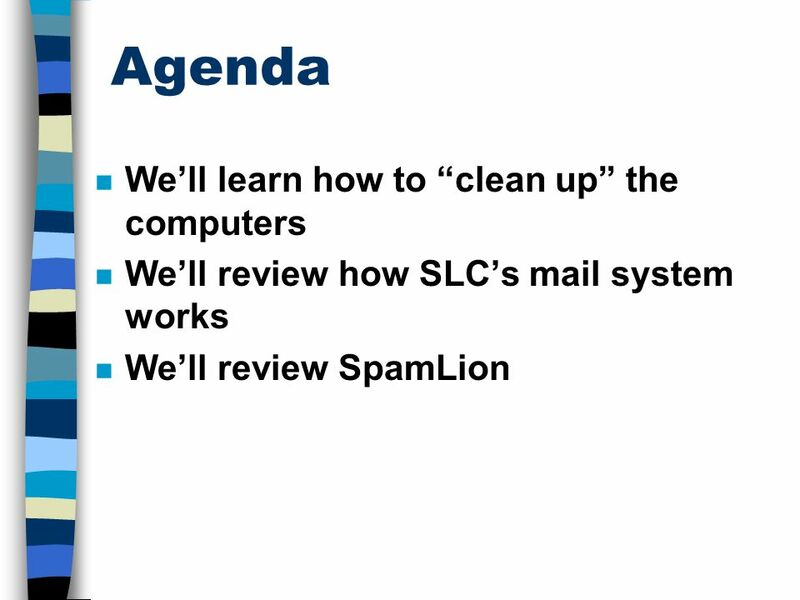 Sterling Heights Public Library Agenda n We’ll learn how to “clean up” the computers n We’ll review how SLC’s mail system works n We’ll review SpamLion. 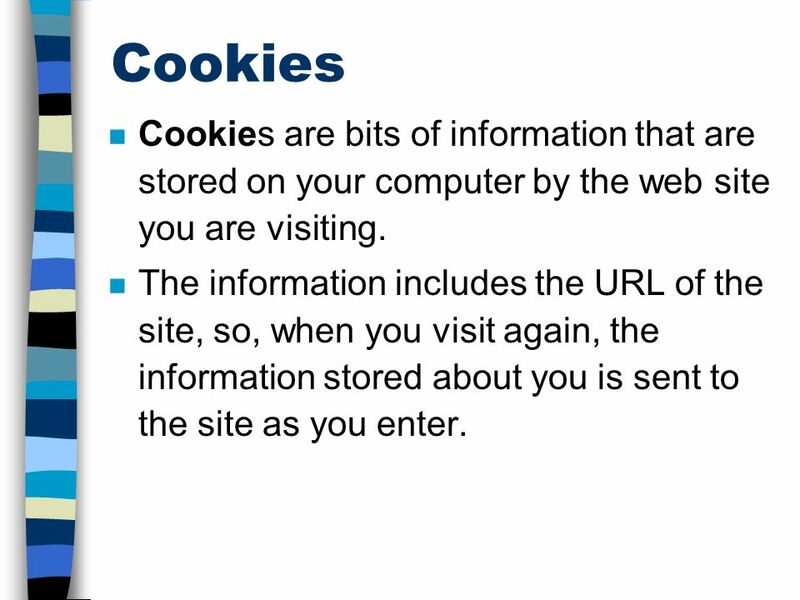 4 Cookies n Cookies are bits of information that are stored on your computer by the web site you are visiting. n The information includes the URL of the site, so, when you visit again, the information stored about you is sent to the site as you enter. 5 Internet Preferences n Preferences or options affect how your screen will look, where items will be saved, cache, and security information. 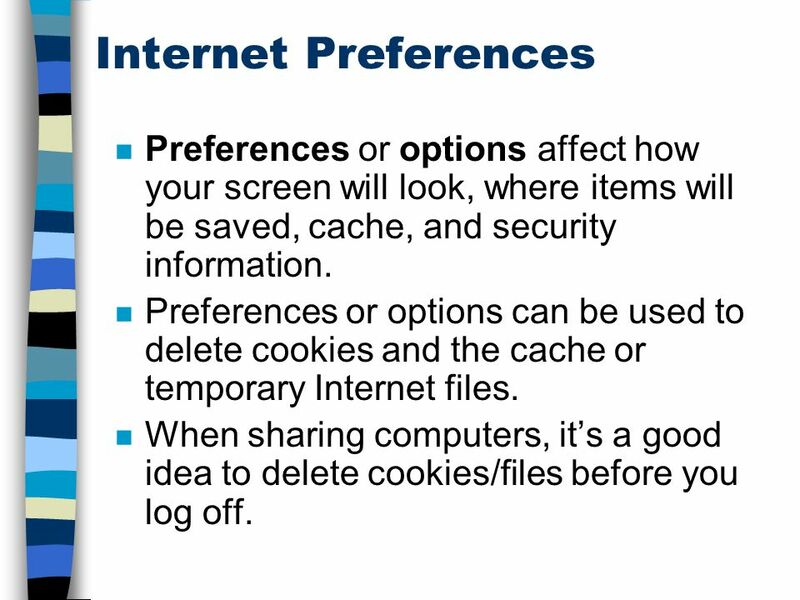 n Preferences or options can be used to delete cookies and the cache or temporary Internet files. n When sharing computers, it’s a good idea to delete cookies/files before you log off. 8 SLC Requests... n Check your e-mail several times a week. Delete mail and empty the trash. 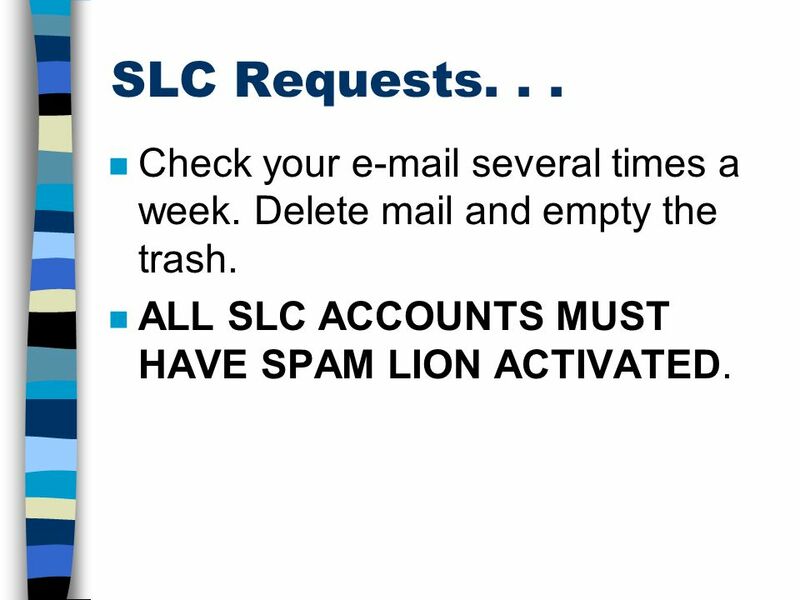 n ALL SLC ACCOUNTS MUST HAVE SPAM LION ACTIVATED. 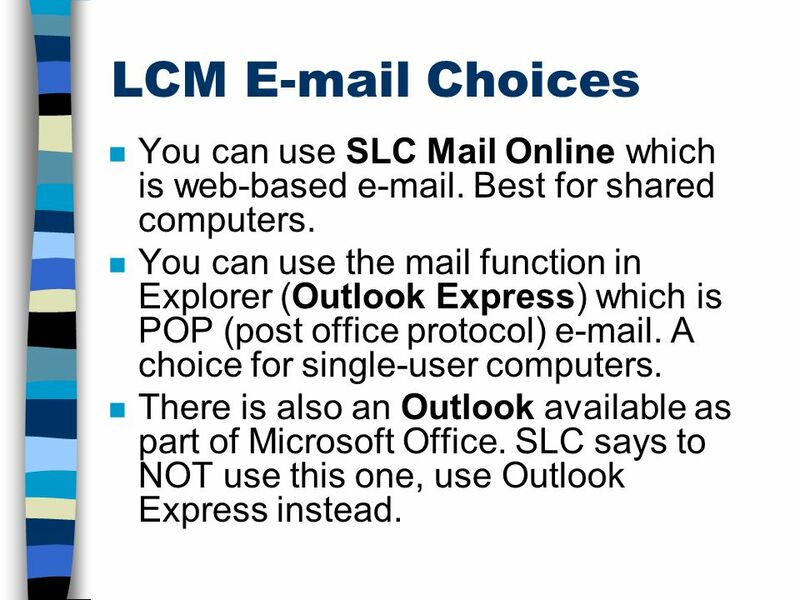 9 LCM E-mail Choices n You can use SLC Mail Online which is web-based e-mail. Best for shared computers. 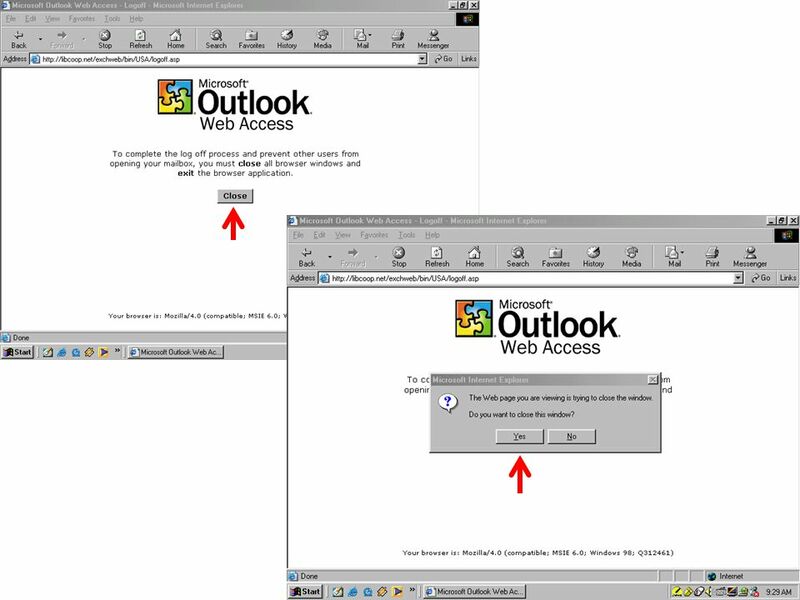 n You can use the mail function in Explorer (Outlook Express) which is POP (post office protocol) e-mail. A choice for single-user computers. 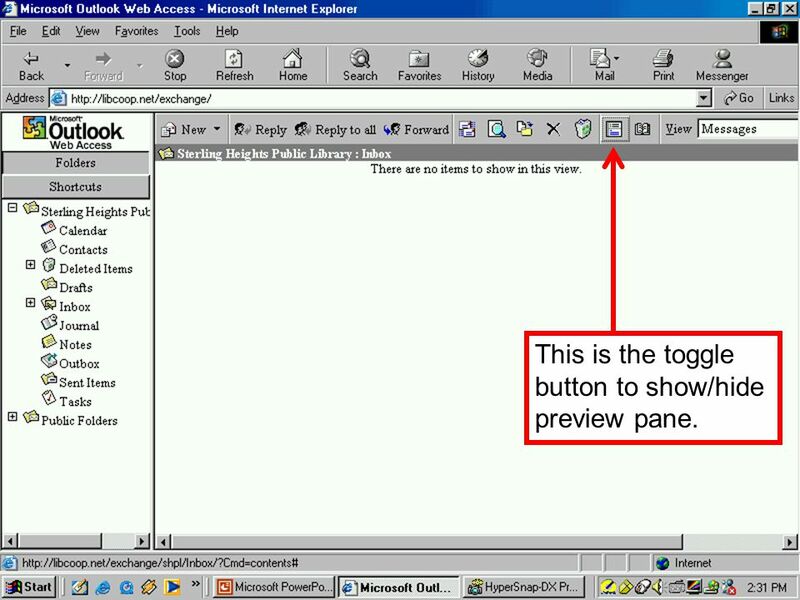 n There is also an Outlook available as part of Microsoft Office. 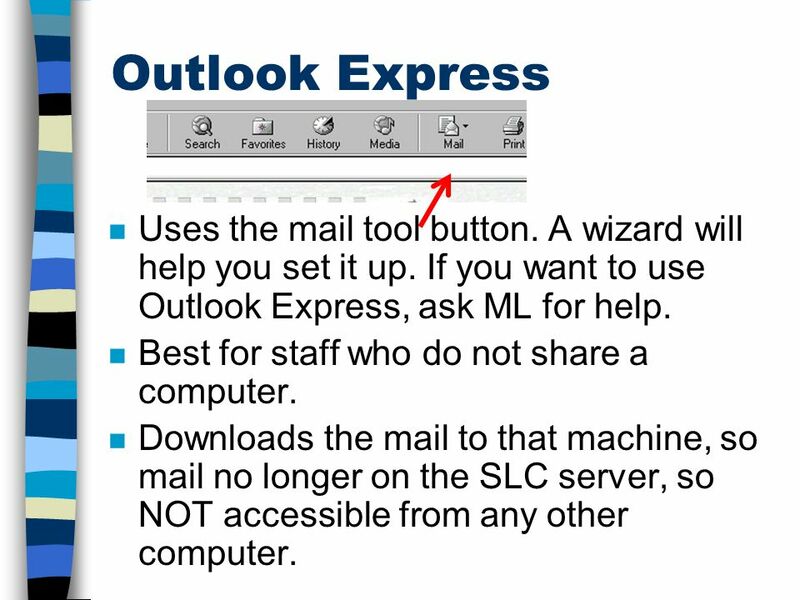 SLC says to NOT use this one, use Outlook Express instead. 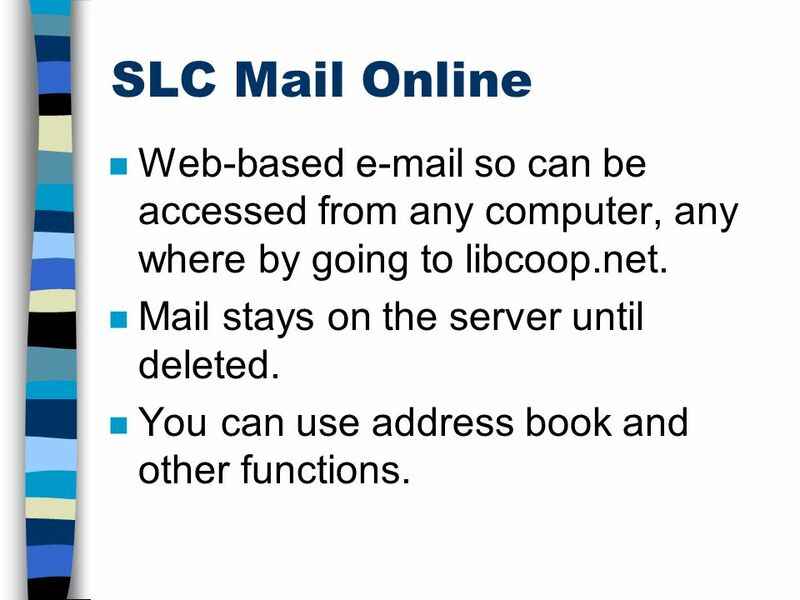 10 SLC Mail Online n Web-based e-mail so can be accessed from any computer, any where by going to libcoop.net. n Mail stays on the server until deleted. 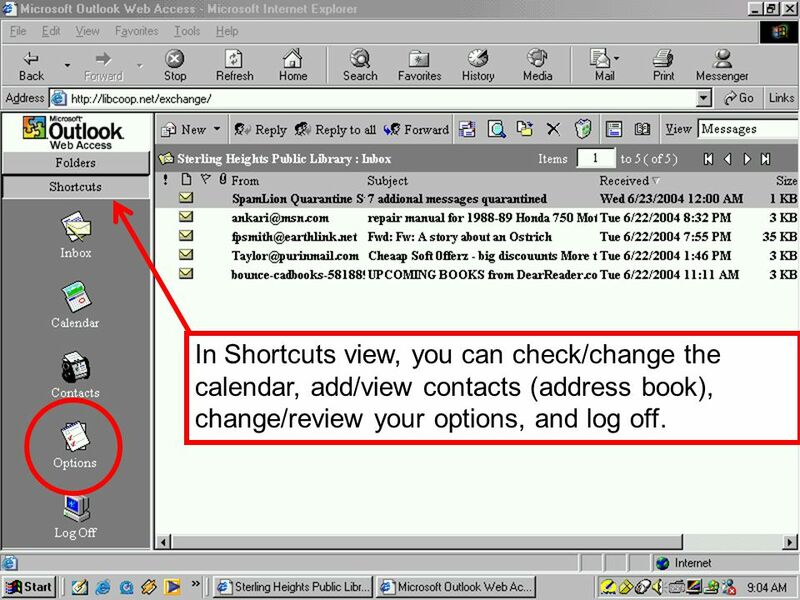 n You can use address book and other functions. 12 This is the preview pane view. 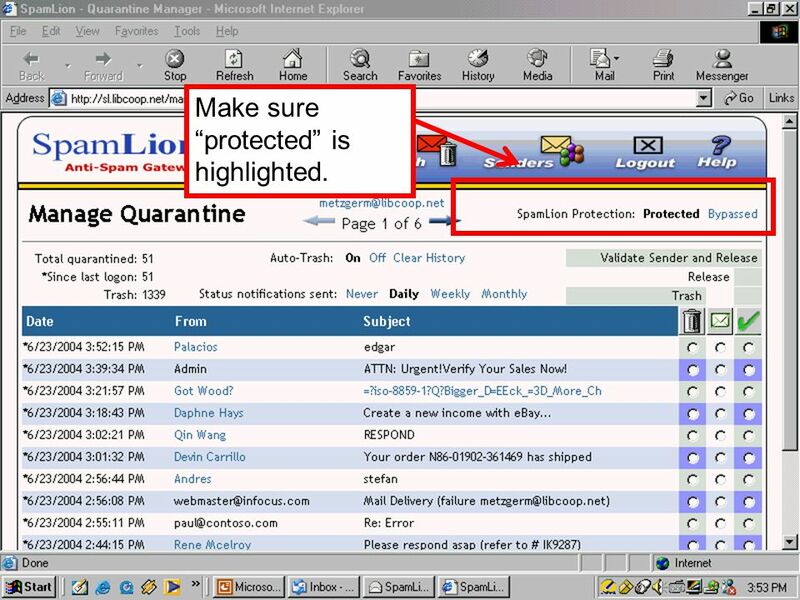 DO NOT USE as some viruses can be imbedded in the message instead of as an attachment. 13 This is the toggle button to show/hide preview pane. 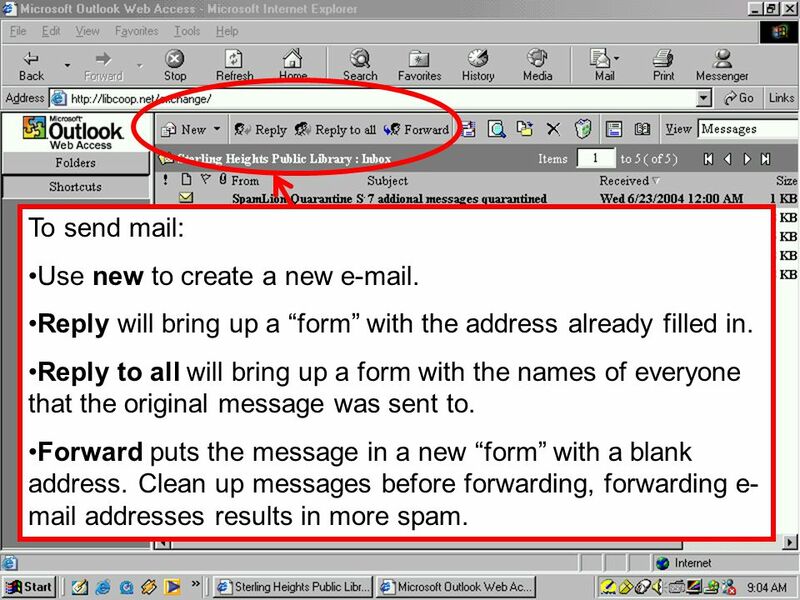 14 To send mail: Use new to create a new e-mail. Reply will bring up a “form” with the address already filled in. Reply to all will bring up a form with the names of everyone that the original message was sent to. Forward puts the message in a new “form” with a blank address. Clean up messages before forwarding, forwarding e- mail addresses results in more spam. 15 In Shortcuts view, you can check/change the calendar, add/view contacts (address book), change/review your options, and log off. 16 Use options to make changes, add an “out of office” note, etc. 18 Folders view allows you to see your folders. 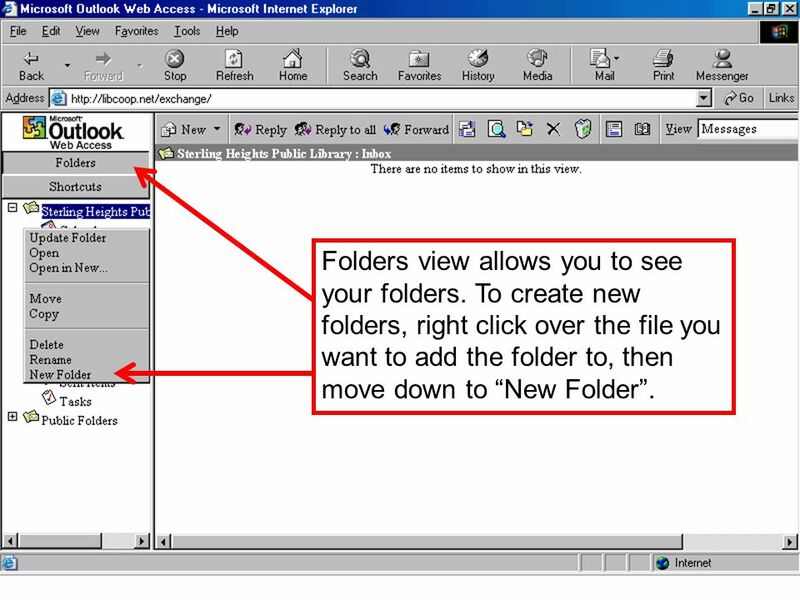 To create new folders, right click over the file you want to add the folder to, then move down to “New Folder”. 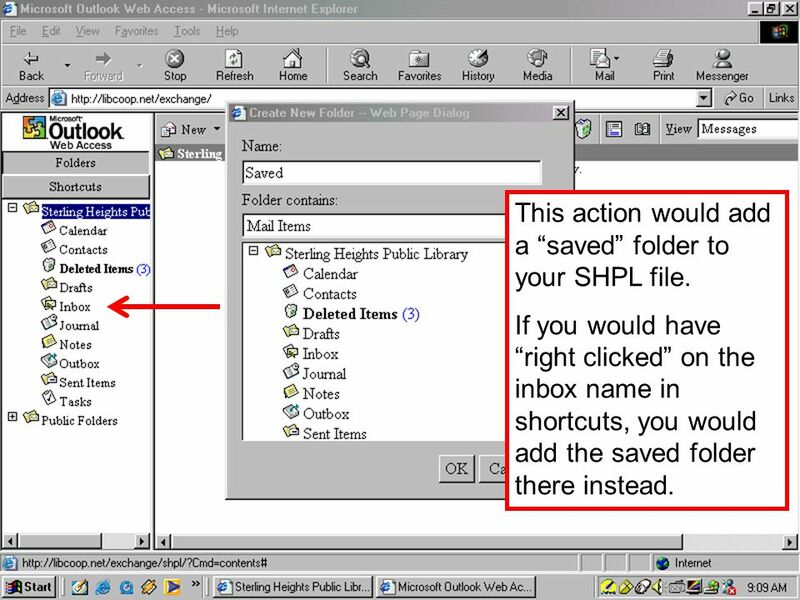 19 This action would add a “saved” folder to your SHPL file. If you would have “right clicked” on the inbox name in shortcuts, you would add the saved folder there instead. 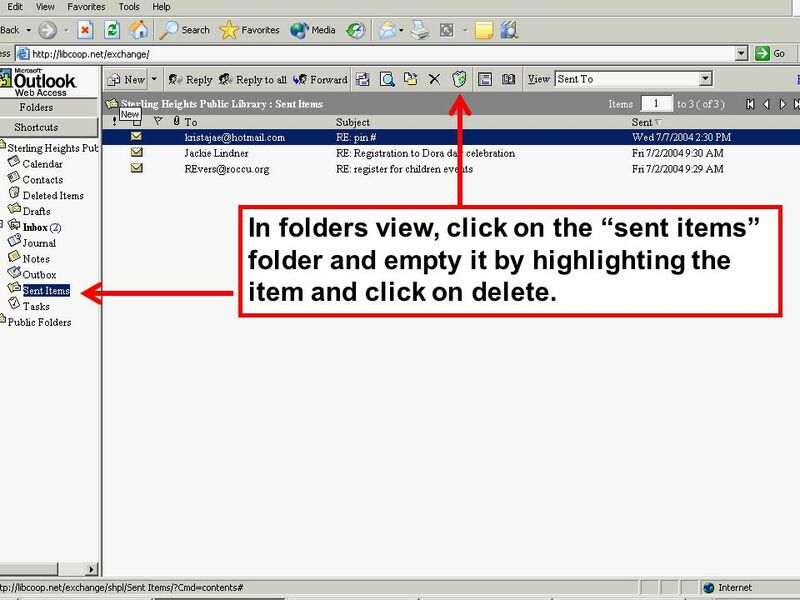 20 In folders view, click on the “sent items” folder and empty it by highlighting the item and click on delete. 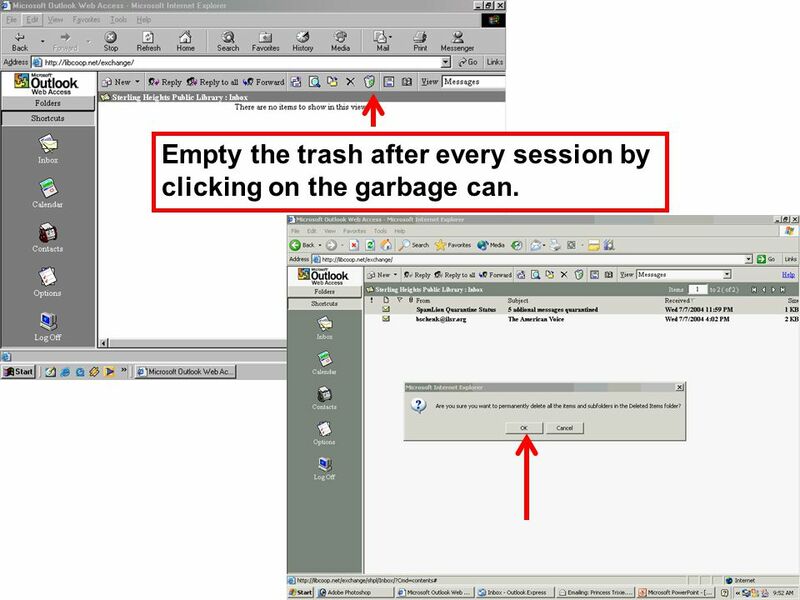 21 Empty the trash after every session by clicking on the garbage can. 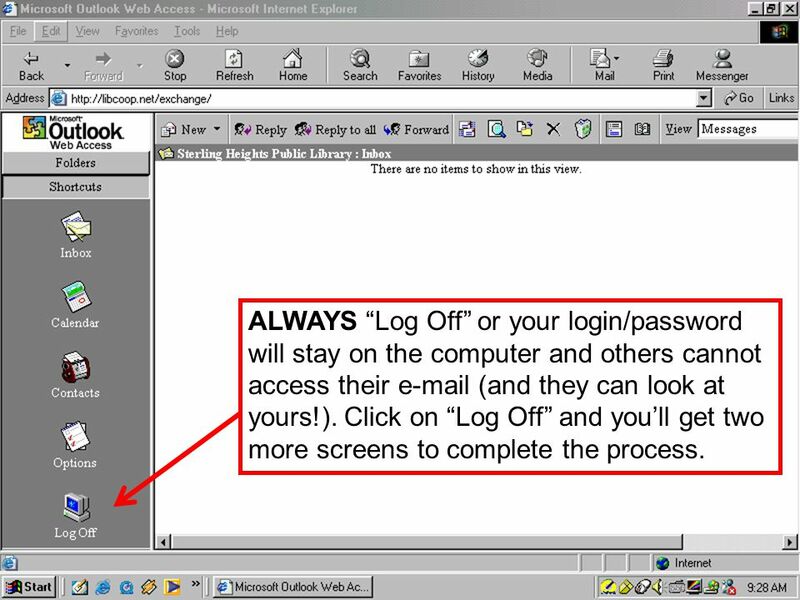 22 ALWAYS “Log Off” or your login/password will stay on the computer and others cannot access their e-mail (and they can look at yours!). Click on “Log Off” and you’ll get two more screens to complete the process. 24 Spam Lion n To open Spam Lion go to sl.libcoop.net. 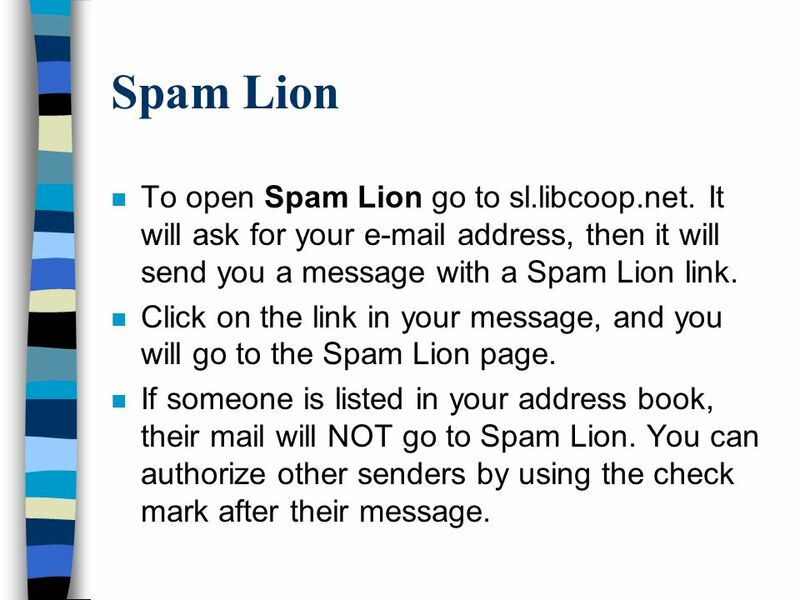 It will ask for your e-mail address, then it will send you a message with a Spam Lion link. 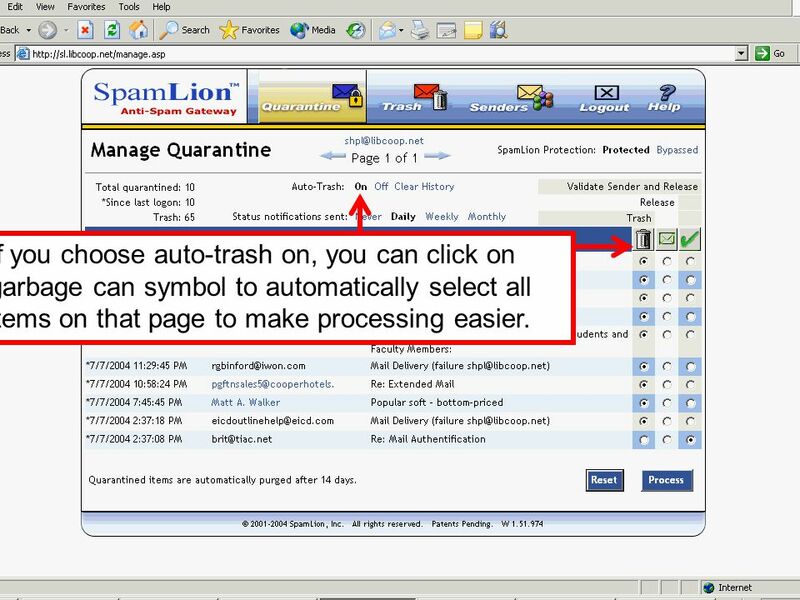 n Click on the link in your message, and you will go to the Spam Lion page. 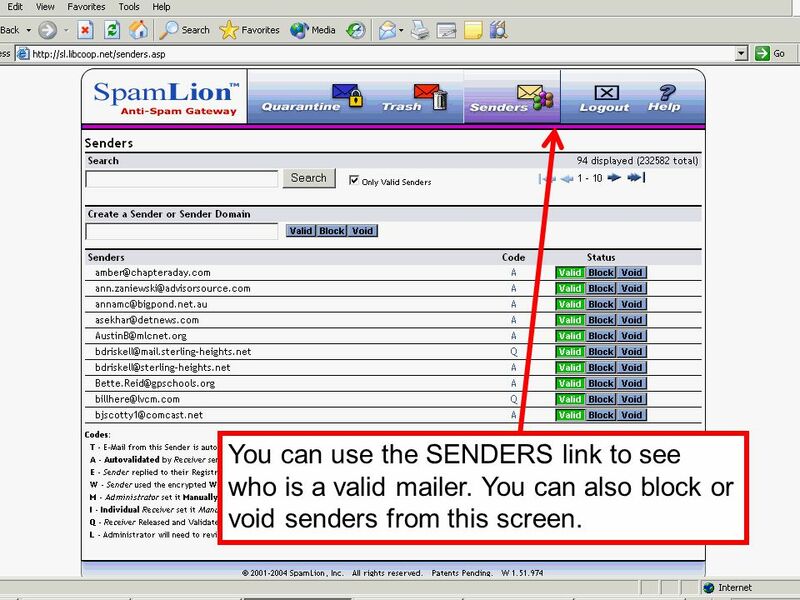 n If someone is listed in your address book, their mail will NOT go to Spam Lion. You can authorize other senders by using the check mark after their message. 25 Make sure “protected” is highlighted. 26 Choose how often you want to be notified. When you receive notification at your specified interval, follow the link, and process the mail. 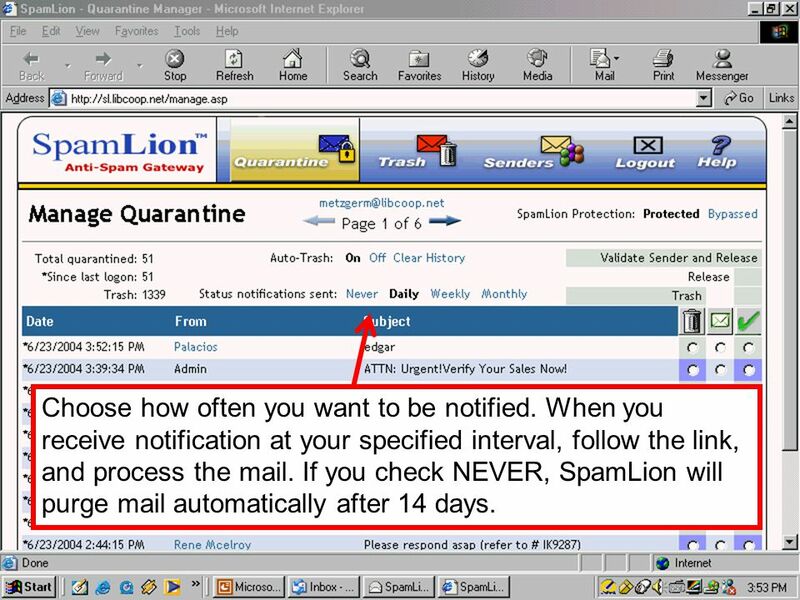 If you check NEVER, SpamLion will purge mail automatically after 14 days. 27 If you choose auto-trash on, you can click on garbage can symbol to automatically select all items on that page to make processing easier. 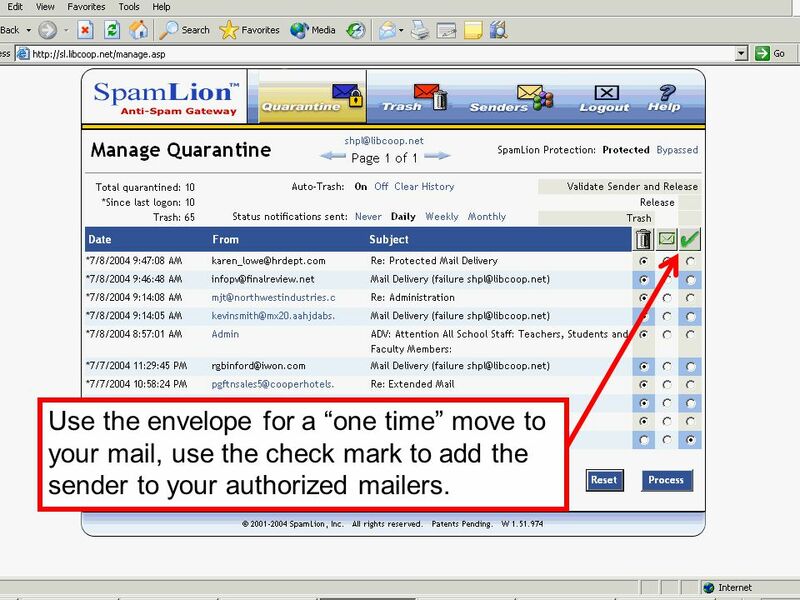 28 Use the envelope for a “one time” move to your mail, use the check mark to add the sender to your authorized mailers. 29 You can use the SENDERS link to see who is a valid mailer. You can also block or void senders from this screen. 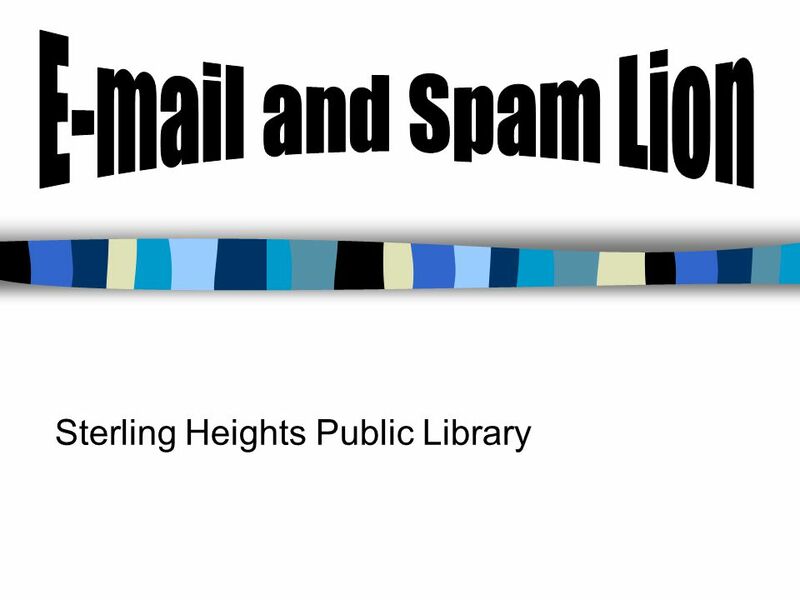 Download ppt "Sterling Heights Public Library Agenda n We’ll learn how to “clean up” the computers n We’ll review how SLC’s mail system works n We’ll review SpamLion." 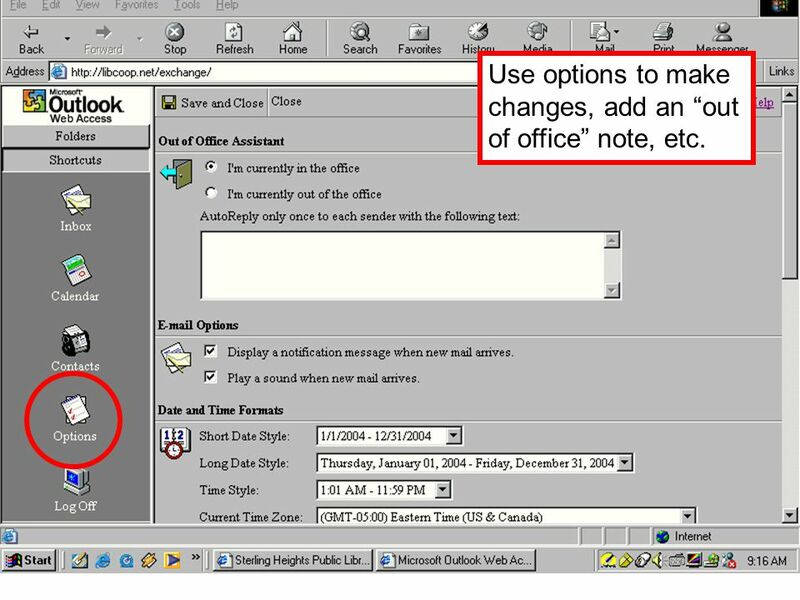 Working with Outlook 2007 at CERN Outlook Main window Customize views Send s Organize s: Category, Follow-up flag, To-Do Bar Create signatures. 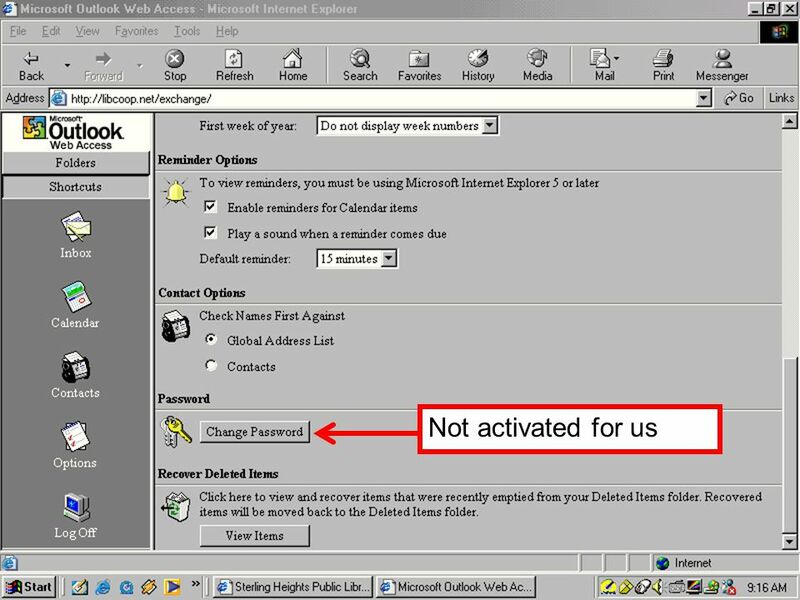 Advanced Outlook. Objectives •Customize Outlook for individual use •Understand and control security options •Create and use folders •Integrate Outlook. The Internet 8th Edition Tutorial 3 Using Web-Based Services for Communication and Collaboration. 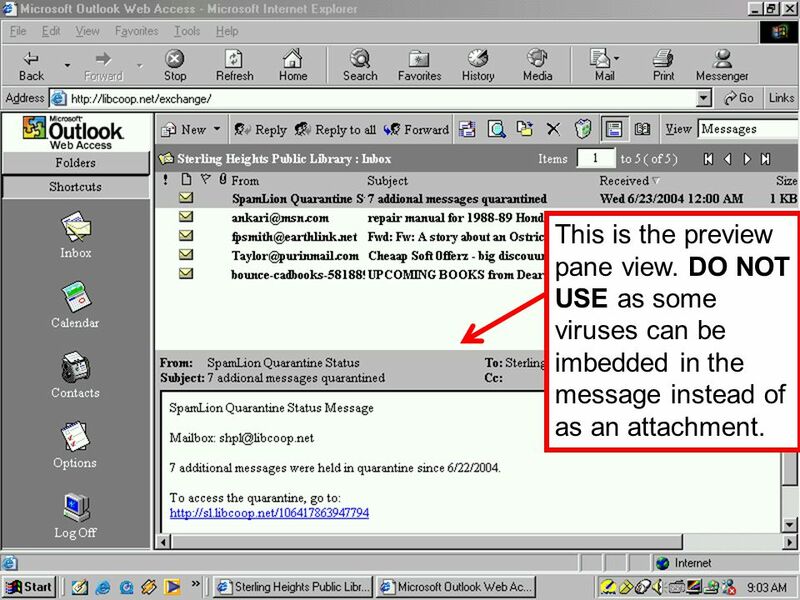 Outlook 2013 Web App (OWA) User Guide Horizon School Division #205. Basics. 2 Class Outline Part 1 - Introduction –Explaining –Parts of an address –Types of services –Acquiring an account. Staff Computer Training Exchange 2003: More User Friendly Vicki Hecht Cherry Delaney ITaP Luncheon October 14, 2003. 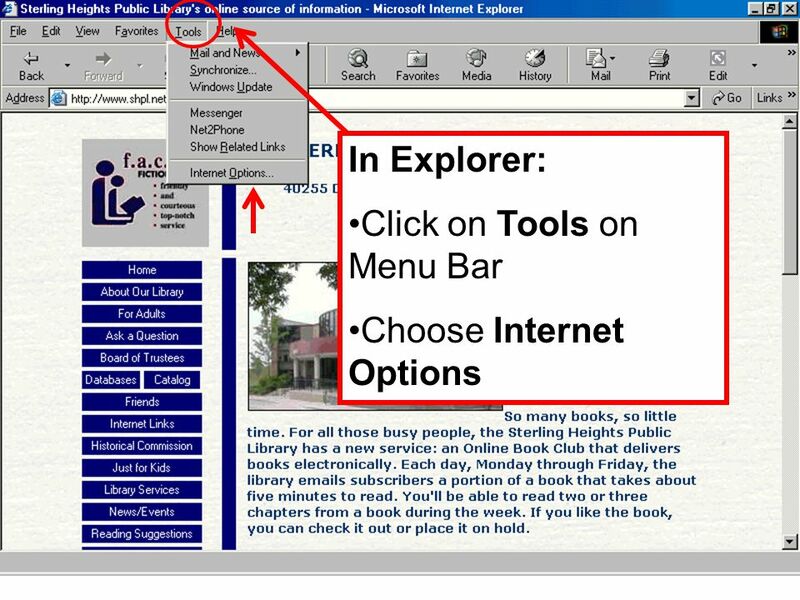 Exploring Microsoft Office Outlook Microsoft Outlook 2000 A Desktop Information Manager By Robert T. Grauer Maryann Barber. Follow these instructions to pay your dues. Get into your web browser Like Internet Explorer Now you need type in this address in the Address bar. Example. 1 RVCC Phone MIS Help Desk, Ext 4357 (HELP) Holly Smythe, Instructional Designer, Ext 8451 Lonny Buinis, Instructional Designer, Ext 8306. 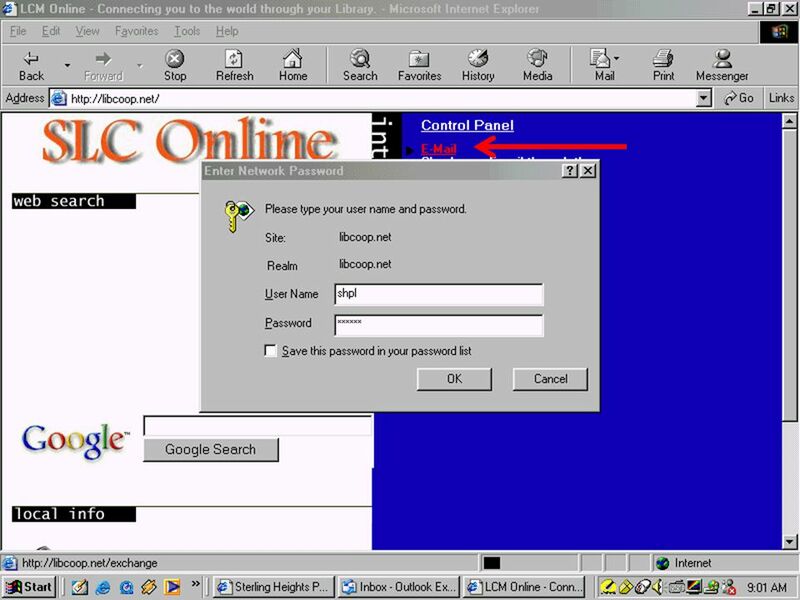 POP Configuration Microsoft Outlook Express 6.x. Technology ICT Option: Email. Email Electronic mail is the transmission of mainly text based messages across networks This can be within a particular.